I was having dinner with a good friend last night, and she reminded me that I hadn't posted on my blog since June 11. Not much has been going on here. I had been sorting through things and shoving boxes and containers around. When things are too heavy to lift, I tend to shove with my knees. And, I ended up injuring one of my knees (my non-replacement knee). It hurt to drive and to go up and down stairs (where my sewing room is), so there hasn't been a lot of sewing going on here. The Dr. gave me a shot of some good medicine in the knee, and it is much, much better now. I've pulled out my Phebe center and have been working on her again. I've got to tell you, I have a lot of respect for anyone that has done these two little people that sit on either side of this vase. Those pieces are really small. I had the vase and stems done on another background and decided I didn't like it, so I've started over. This is my progress so far. These are two of the stars that go on the inner star border. I chose the fabrics and made these about a month apart. Looks like I really like these fabrics since I picked them out twice. I've been cutting kits for the rest of the stars. I'm heading out of town today to see two of my Aunts. One is 101- the oldest resident of Fulton County, Indiana. The other was 95 and just passed away, so I'm heading there to be with my cousins. Here's another post I saved in Drafts and forgot to publish. Here are a few more photos of show and tell. These were taken before show and tell. This quilt belongs to CJ. 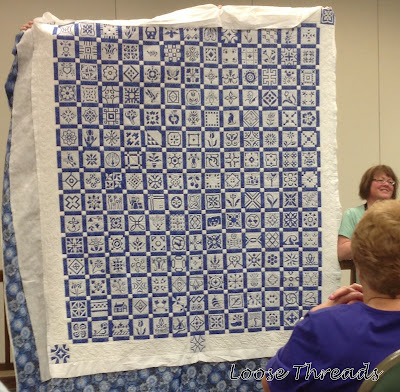 This is one of her Dear Janes using all music fabrics. Beautiful! This is another of CJs Dear Jane quilts. I believe she has made 6 Dear Janes! This was what Kim was working on at the retreat. 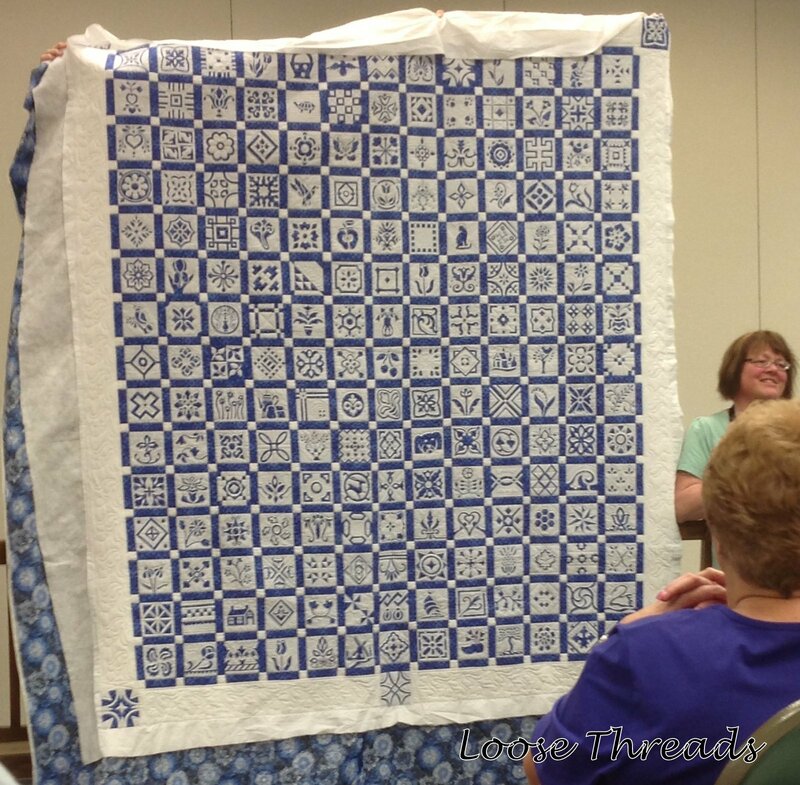 I believe this is a wedding present, so we won't see the finished quilt. Love this pattern. This horse and buggy is parked outside the Blue Gate Restaurant waiting to take riders on a tour of the town. They have a lot of beautiful things..... I found this Christmas room. I love how they have decorated these clear vases with greenery, beads and miniature lights. I came home with a box of these tiny little lights. Wizard of Oz figurines made by Jim Shore. Then I went on over to Yoders. 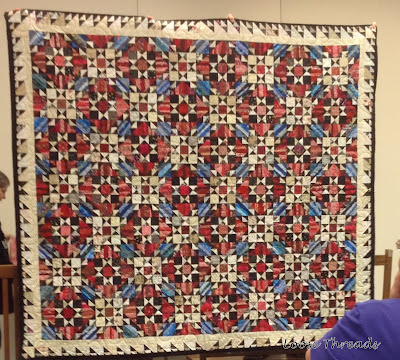 A beautiful patriotic star quilt. Red, white and blue yo-yos. What used to be the grocery at Yoders is going to be a restaurant. Here is a look inside the door. And, this will most likely be the dining room. Then I went on over to Lolly's. 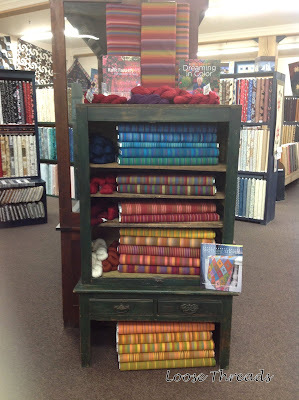 Here is the display of the new Kaffe Fassett stripes. Then on downstairs to the Cuddle Shop. I love this fall cuddle quilt. Here is just part of the shop. We had a great time as always in Shipshewana and can't wait to get back again in November. You know how your emails just kind of scroll off of your computer screen, and sometimes that means out of sight - out of mind. Well, I do the same with my blog posts. I add photos to a post that I plan to blog about, but a lot of times I don't get back to add text. This is a post that I intended to publish after our Dear Jane retreat in Shipshewana last month. I didn't want you to miss these quilts. This group has a lot of amazing quilters. Enjoy the show! Tracy's Just Takes Two Quilt. Pattern by Gay of www.sentimentalstitches.com and Brenda www.dearjane.com. 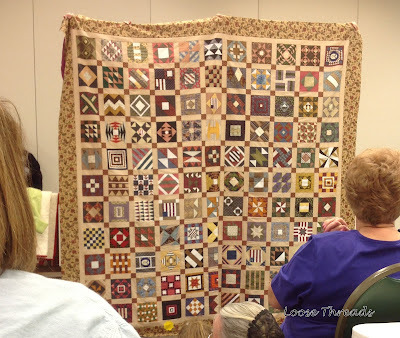 Here's the link to Tracy's blog, TLC Quilts and Walks. Aunt Millie's Garden. It's just beautiful. I'm sorry I can't remember who the maker is. Maybe Gretchen? 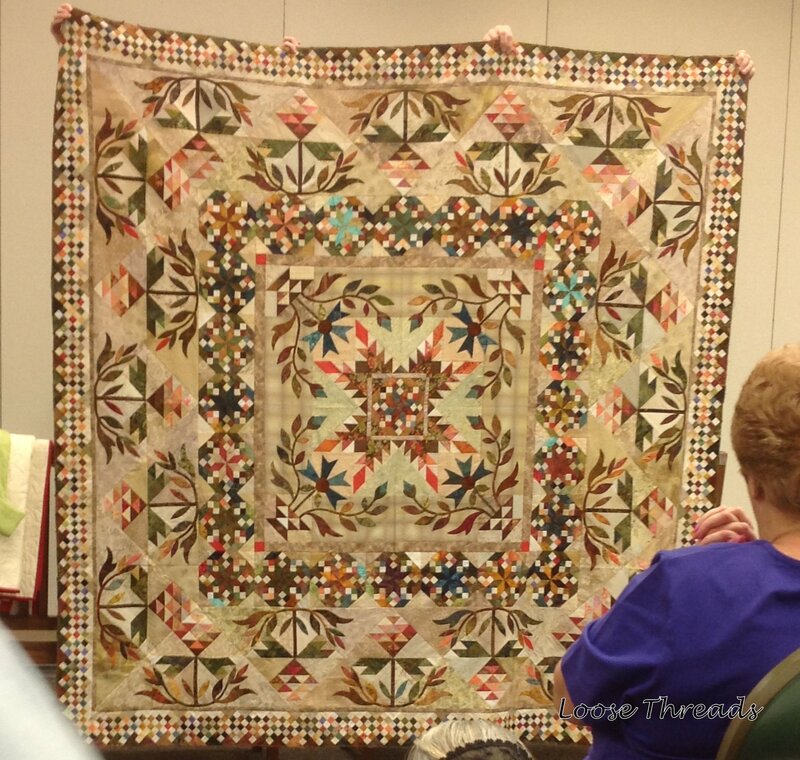 I don't know the name of the quilt or maker. I think this might be from the book Civil War Diary Quilt by Rosemary Youngs but not sure of the maker. If anyone knows, email me. Easy Street by Judy. 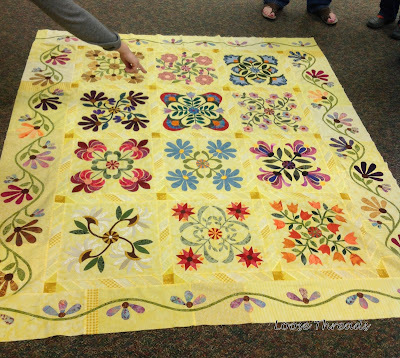 (Easy Street is Bonnie Hunter's mystery quilt from 2012.) 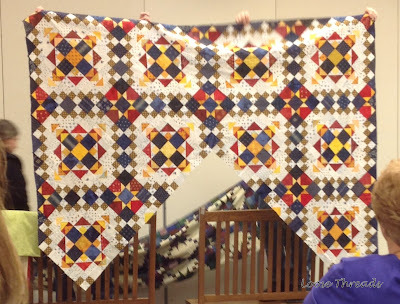 Visit Judy's blog, Small Quilts and Doll Quilts. 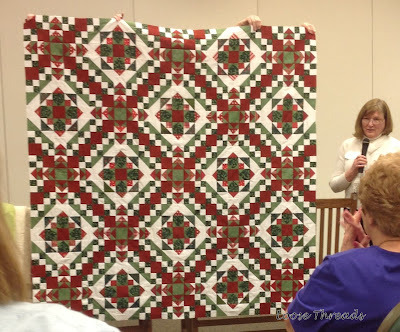 Judy used reds and greens for her Easy Street quilt, and she has set her blocks differently than the pattern. It's just gorgeous. 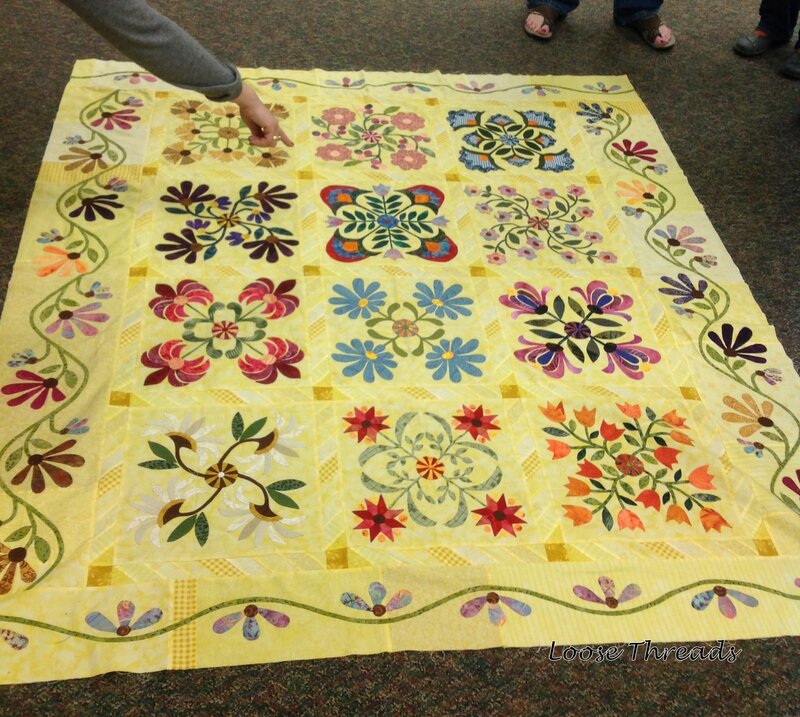 Here is another Easy Street Quilt. 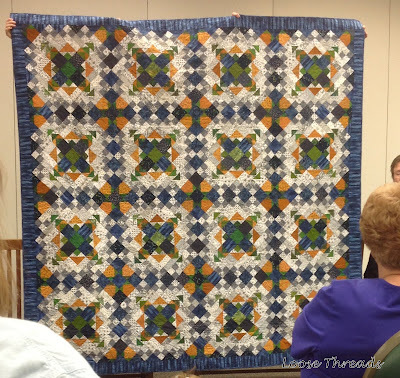 This quilt is close to the colors that Bonnie Hunter used in her Easy Street Mystery quilt. Kim used a great color combination, and I think this quilt is made entirely from her stash. Visit her blog Quiltmom here. 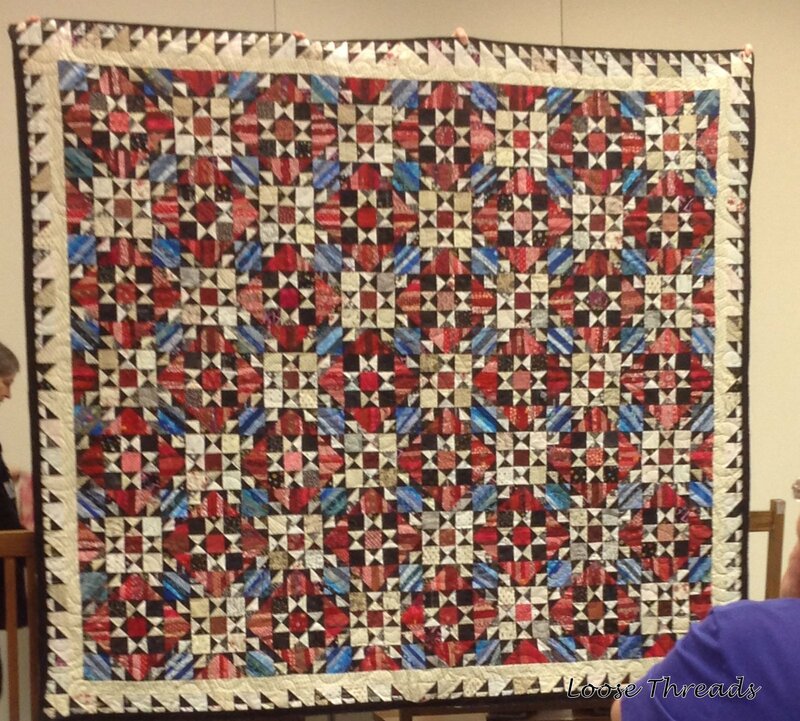 This is Orca Bay, the Quiltville Mystery Quilt from 2011. 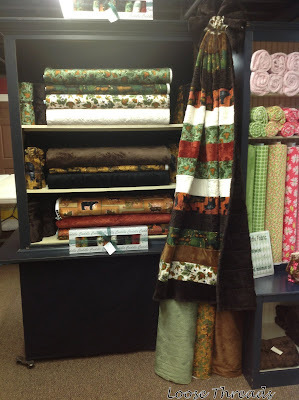 Here is another quilt shop that I stopped at on our way back from Tennessee. 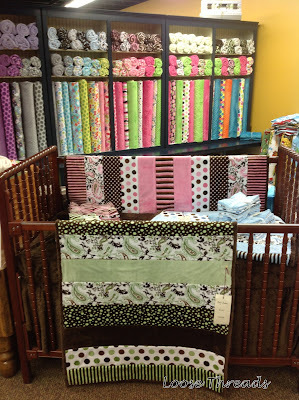 This is Bella Quilts in Hamilton, Ohio. They are working to put their fabrics on line so hopefully we will be able to go to www.bellaquiltsoh.com and order from them soon. Raven, the owner was kind enough to allow me to take photos for a blog post. She also gave me a photocopy of a quilt using the Winterthur John Hewson panel, birds, and companion fabrics that I bought there. She has an excellent selection of reproduction fabrics for those of us that like Civil War/reproduction fabrics. I hope you can zoom in on the photos to get a look at the fabrics. The first photo is just a random shot back into the shop. Here are the repros......... See the bolt that is at the right of the very first section? 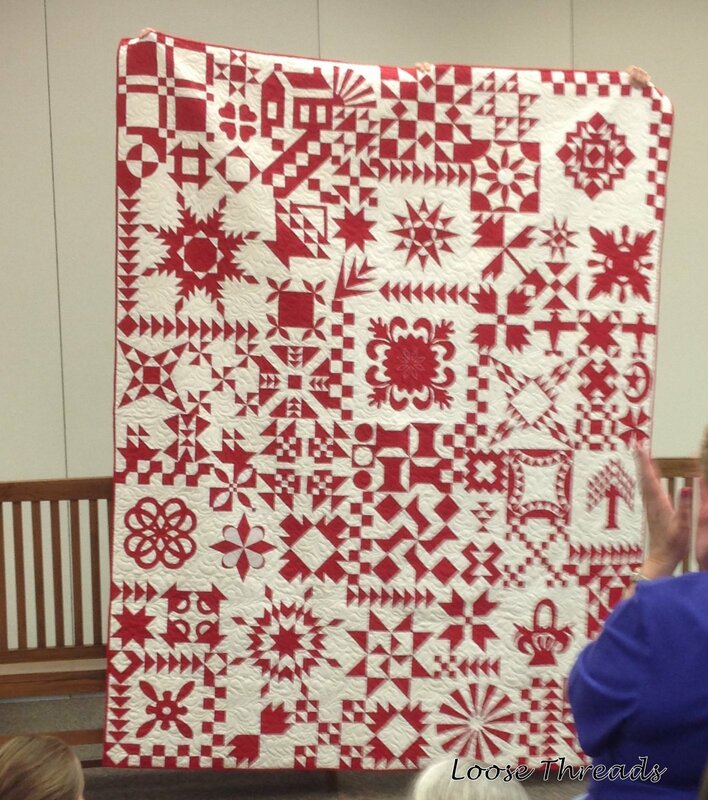 That is the border used in the Ann Daggs quilt in Di Ford's new book Primarily Quilts. 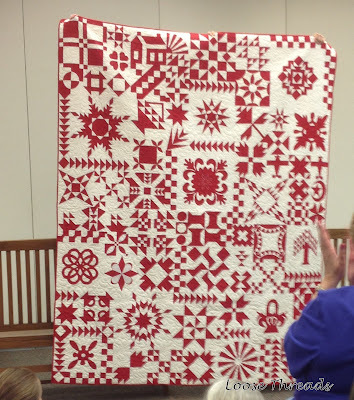 On the bottom right shelf is the wavy red fabric from the Old Sturbridge Village Collection used in the skirt of the girl in the center of the Phebe quilt. And even more..... There were some that I forgot to photograph. 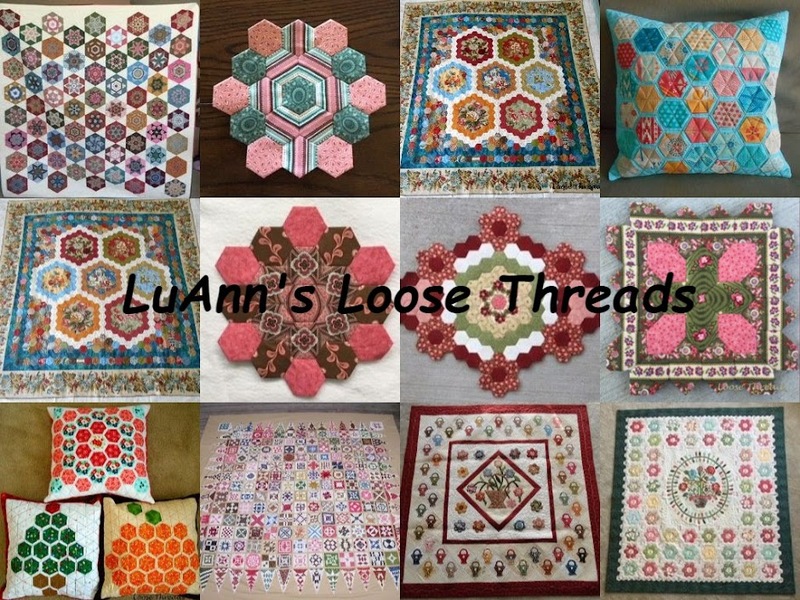 In the bottom row just a bit to the left of center, the brown/red border print is the one used in the Rotherfield Grey quilt in Primarily Quilts. Can you tell that I really like this book? The fabrics straight on are all batiks. Over to the left below the window were Kansas Troubles. These were part of the sale fabrics. I'm planning a day trip back to Ohio to spend more time at Bella Quilts and to stop at IKEA.